Isn't that great? I will be doing some of these designs in the the green squares. I am thinking purple thread on them. What do you think? Purple? Or should I go with a bright red? I just found out about a cool contest. The post on the Riley Blake Blog (click here) tells about it. 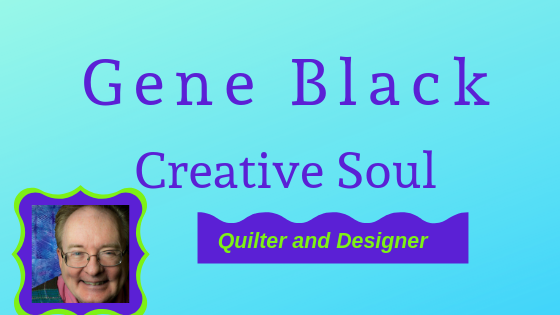 If you have a quilt you have made with Riley Blake fabrics you can post a picture of it on their contest page and have a chance to win cool prizes including a Caribbean vacation. 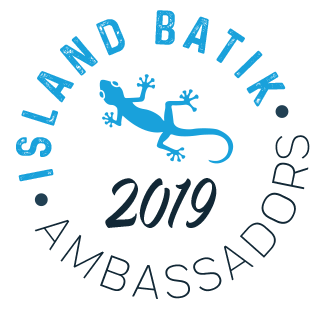 Yeah, I am in! Hi folks. I have some things to tell you about. I even have some NEW pictures! Yaay. I layered it (and you got a peek at the backing) Then last night I started the quilting on it. I decided to do a wavy grid but avoid the large solid green blocks where I want to do something special. So I went at it. I got a lot done but I didn't get this half of the quilt done just yet. Here is the back as it looks draped over the recliner. There is more to be added later when I do the other half. Here is a look at the wavy grid. I cut many of the pieces for the front of this quilt with my Go! cutter. Today I got a nice email from Carolyn. She told me about this sale that AccuQuilt has going on. It is called the "Go! For It Die Sale"
If you would like to get emails from AccuQult about all of their sales just look in my sidebar and you will see the 22 free patterns when you sign up. If you sign up from my blog, I get points. Enough points and I can get something free or at a discount. You know I like that. So sign up if you want to. Now, that recliner is calling my name....I am glad I moved the quilt already. I don't think I will get anything done tonight. I have a pain in my side from the "mystery lump" - The doc thinks it is a fatty tumor, but I am thinking hernia because of the pain. I have an appointment in a week to get further evaluation. Till then, I am not fretting too much about it. And I am trying to not do too much just in case it is a hernia. No one told me getting old would be such fun crap an adventure! The plan is to do the quilt in two pieces and then join them with sashing strips. So I have half of the quilt layered and ready for quilting. Here is a peek showing some of the front. I rolled it because I use a friends floor to layer it in. I have "basted" it with hair spray (Aqua Net -in a can) It will be easy to get out those wrinkles you see in the pictures - so don't panic. I will actually put it on the ironing board at home and get it straight. Then when I iron it the "spray basting" will really hold nicely till I get it quilted. 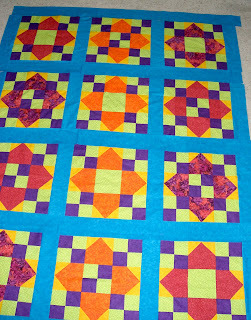 After the quilt is done, it washes out nicely. Here is an image of the top. 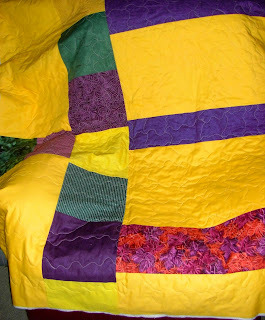 Can anyone suggest a name for this quilt? Here is a great deal. 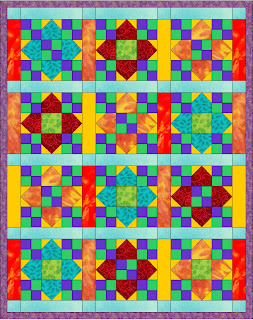 Sign up for the AccuQuilt newsletter and get 22 free patterns. Just click the picture. Okay, this will be short. I have been quite busy with the new princess (great niece) Today I left for work early and went to hold her for a bit before I had to go to work. (yes I made it to work on time--but yeah, I wanted to just call in sick!) I even managed to stay at work all day. I had bought some cloth diapers a couple of months ago to make some burp cloths. I think they are too thin to use just one layer so I folded them in thirds and sewed a wide binding around 3 edges. Then I sewed a simple straight seam up the other side to secure the inside folded edge. Now I think that was probably unnecessary but it will keep it a bit neater when washed I think. Isn't that heart and flower fabric just perfect for this? I love the little bird carrying a rose on the white one. And here is a peek at the princess. Friday, which at this point is tomorrow, she goes home from the birthing center. I am taking off work since I have some comp time (leave that is given instead of paying us for overtime!) that needs used. I will be there with these little presents. The sweet baby girl arrived yesterday morning before I got to the hospital. She and her mommy are doing well. I spent some quality time holding her. She is a sweet baby. Her hair is curly and between red and brown. I just know she will grow up to be beautiful. I found a picture of the finished quilt that she got as her very first birthday present. I did some free motion swirls, vines and a variety of stitches on it. My niece (the mommy) loved it. She told me this evening that she showed it to everyone. She also asked me if I can teach her to make quilts. So if I win one of those GO! Baby's on a blog, I suppose she will get it. I will be happy to pass on the quilting tradition to my sweet niece. Hopefully, if I do, she will pass the tradition on and keep it going. Are you passing the tradition on? Or if you are a first generation quilter, do you plan to be the start of the tradition in your family and teach someone younger to quilt? 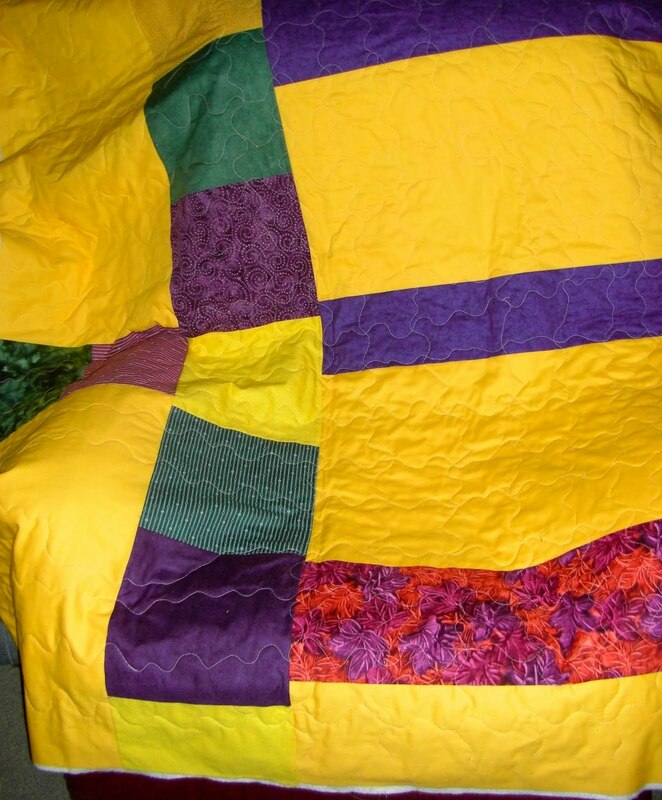 Quilting is a great family tradition. Woo hoo! I got an early call this morning. My darling niece is at the hospital having a new grand niece just for me. Well okay, maybe not "just for me" but still. I may be out of the loop for a few days here. Luckily I have this quilt to take with me to present to Tiny Miss Emily when she shows up.Sorry that this is the old picture before it was quilted from Flickr. Blogger won't let me upload and add OR use one of my old pictures this morning....and as you can guess. I am now in a hurry. Because what better way to welcome a new princess than with Pink Diamonds? Pink Diamonds, a photo by GeneBlack on Flickr. So sorry that I am not posting a lot lately. I have had too much going on in my life. I will be going to the doctor today as I discovered a "thing" on my side. I think it may be a hernia or a soft tissue mass. Whatever, I found it Sunday and it is getting seen about today! I may not find out anything and just get a referral, but I am starting the process. (TMI?) Well folks, we must take care of ourselves. I hate visiting the doctor as it seems like wasted time, but I want to be here a while longer. Life is good. 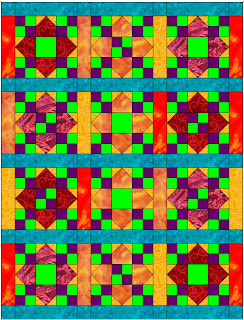 Quilt news: I have the commission quilt top in two pieces and am ready to layer those and quilt - but I think I will do some piecing for the back yet. I don't like to post pictureless so I am putting up a painting I did that now belongs to my brother. 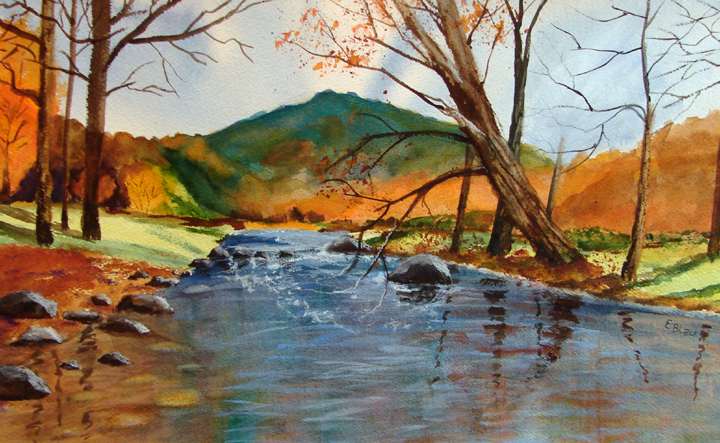 This one is watercolor and is really "not my style" but it is a cool painting. Now if you click on that and enlarge it, you will see some small oopsies in my sewing. 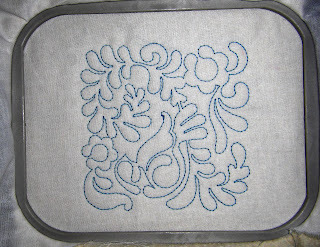 This was only a test block so I didn't change the thread in the machine to match when I sewed down the curved edges. 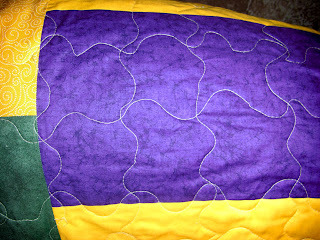 The block is made with three seams, but then you do have to sew some more to make those curved edges. This is really easy. I used 5 inch squares but any size would work. In the video she uses 10" layer cake squares. I probably would not go smaller than 5" squares.as it could get difficult to sew the 3rd seam without catching the center. But if you have an Accuquilt GO! with the 5" square or 6 1/2" square or even the 8 1/2" square you can cut the pieces quick and easy to make this. 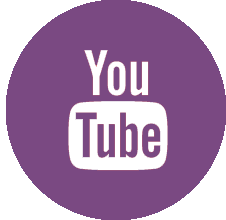 Watch the video and learn how to do it for yourself. But read the rest of the post before you try it! Let me mention that she doesn't show exactly how to do the first two seams. You put the folded piece between two of the squares (right sides together) -sew seam one. Fold the squares back out of the way and do the other two squares on the other end of the folded piece. Why did I tell you this? Ha ha.. I really messed it up the first time. So I decided to help you avoid my mistake. I may experiment with a larger piece for the center and just see what happens. The worst that can happen is an oops. But the best could be wonderful! I also just have to share this lovely moment from my good friends at AccuQuilt from the first ever Go! Quilting retreat. I wish I had been there. Now you see why I wish I had been there. It was a lot of fun and EVERYONE got a GO! Baby to take home with them. I would love to have a Baby for travel when I don't really have room for the GO! Cutter. I know that some of you have wondered where I have been lately. Work has been quite hectic. We have had to do some outdoor "exercises" (practicing for an event) in this torturous heat. So I have been drained on arriving home. Needless to say, I have let the sewing lapse a bit. I have done some mindless sewing, but nothing yet worth showing. So today I am going to show you "Tomatoes for Pablo"
This is a painting that I did as a tribute to Pablo Picasso. It is an abstract and the tomatoes "float" in an amorphous space. amorphous: without classification or definite shape; undefined. I hope you enjoy it. If you would like to view more of my abstract paintings go to my gallery of abstracts. Some of my floral works are in this gallery. Some of my landscape works are in this gallery. More sewing and quilt stuff as soon as I am able. One of my joys in quilting is finding secondary designs. 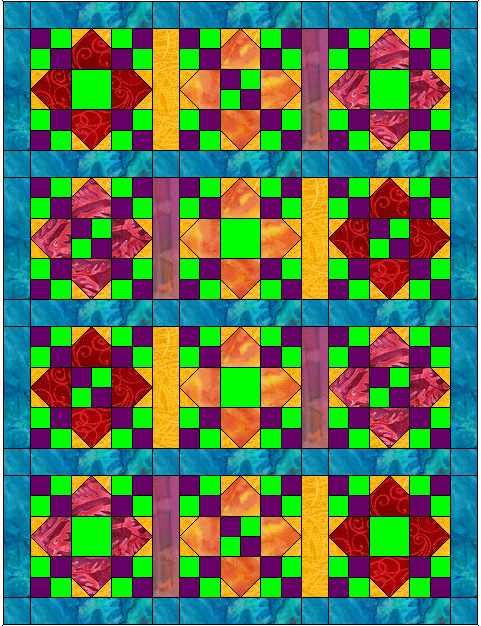 I was looking at the commission quilt (previous post) and saw this secondary design created by the block and the sashing. How cool does that little "block" look? 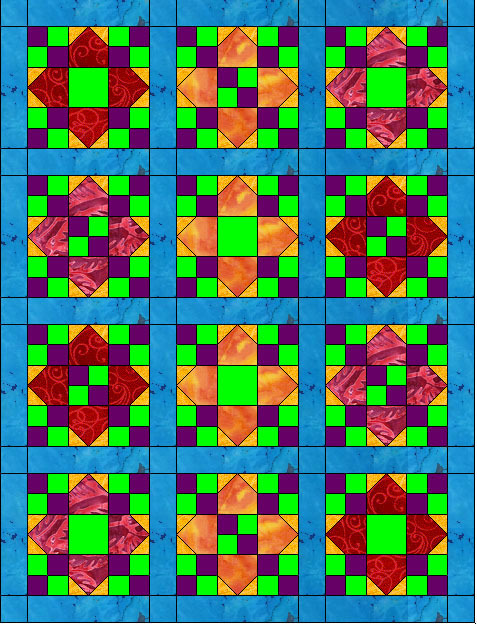 I did some playing with the image and did a "mini quilt" image from it. 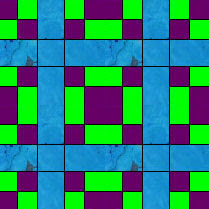 When you make this block in multiples and join them there is yet another secondary design. Ha ha...but now I see that the "center" of this is an actual block, so you could just make that block and sash it. Or you could make the secondary block and sash it. That would give you this quilt. The floating four patches should be pretty easy to make. I hope someone makes at least a small one and blogs it. I would love to see it done. If not, I may make a small one later and do a tutorial. Okay, I suppose this gives you a little idea how an artist/designer's mind works. Scary isn't it? Oh yes, I sewed the vertical sashings on the blocks and sewed the horizontal rows. I put it on my design floor and put the horizontal sashing strips across it so I could have a little audition of how it will look. The horizontal sashing strips have to be measured and trimmed to fit before they are sewn on...so ignore the ends hanging off or not even. Oooh... pretty. I want to keep it. Sigh! I will just have to enjoy it while I have it. I am filing this "slightly strange" color combo away in my head because I love it. I haven't decided on backing yet. I am thinking maybe a scrappy backing using some of the leftover pieces along with some other fabrics. I have spoken with the lady who has commissioned this quilt I am working on. I did some changes. (Thanks for your thoughts! I do appreciate it.) However, now all the blocks have been rearranged. The sashing has been changed and I am ready to move forward with adding the sashing. Here is the EQ mock-up I did. Her exact quote on seeing it? "This is great!!!!!!!!" I am thinking those open centers may get some special quilting. 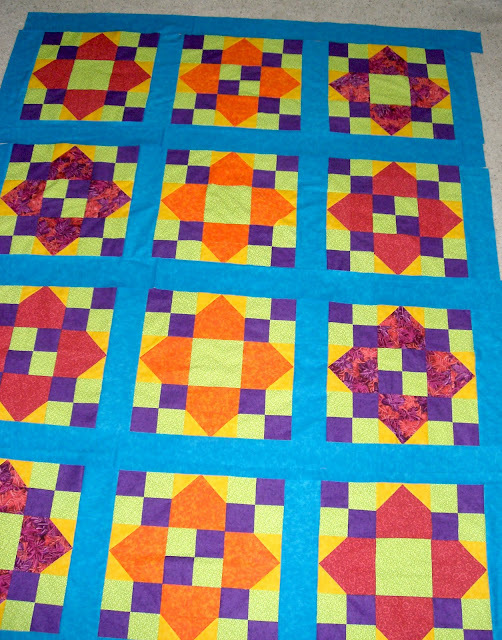 I can not believe it, but I have the 12 HUGE (18") blocks made for the commission quilt. That is right, I sat last night and sewed my brains out. I am very happy with the blocks. I will be putting 4" sashings between the rows. I rearranged the layout when I realized that it was not quite "right." Now that I realize also that the "purple-red" blocks look more red than purple, I am thinking of changing the sashings also. Would you like what is behind door # 1? I have a nice green (see last post) that is also an option. I am sure I will be laying out the squares and the fabrics for auditions sometime tonight or this weekend. Hi, my name is Gene and I need a 12 step program. You see, I am a fabricaholic. I got lost (not exactly lost, I knew where I was and that I shouldn't be there) on the internet and landed on Connecting Threads. I had just deposited the $$ from the baby quilt commission and lost control. I wandered through the clearance fabrics and found a cart full of goodies. I mean, how could I resist? The leaf print fabrics on the right of the picture were in the "seconds" section. It said "Rows of leaves slope crooked on one side of the selvage. " I have unfolded each of the colors, I can't find a problem. I also ordered some of the Essential Thread in my "go to" cream color. The spools on both machines were getting low and I have quilt making to do. I feel slightly guilty about buying more fabric, but then I just looked and I have 17 yards of fabric in that pile. I also got a 5000 yard cone of thread and two 1200 yard spools. All of that - under sixty dollars. Okay, now I feel like a smart shopper! I see some of this having a good chance at ending up in the quilt I am working on now...just saying! 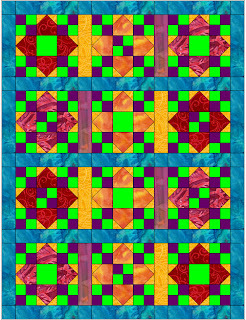 The blocks for the quilt I am making will be 18" square. There will be 4" sashings. This is a large scale design. I think it is going to be nice and bold. I got three of the blocks completed. I took a picture -using my every handy design floor to lay them out on. The block closest to me washed out in the flash so I cropped that part off. So you get to see two of the blocks. The green looks truer in the top block. Interestingly, the purple/red fabric looks much more red than purple. This is slightly changing my color scheme, but I think it will still work out. I may have to rearrange the sashing plan. 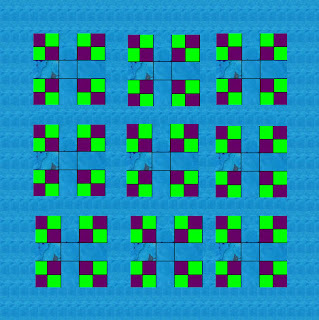 You will notice that one block has a four patch center and one has a plain center. These are currently planned to alternate in the final quilt. Ha! I am keeping my fingers crossed that it comes out right. While I got some great comments on yesterday's quilt, the design wasn't quite "me." So I played a bit and made a change. 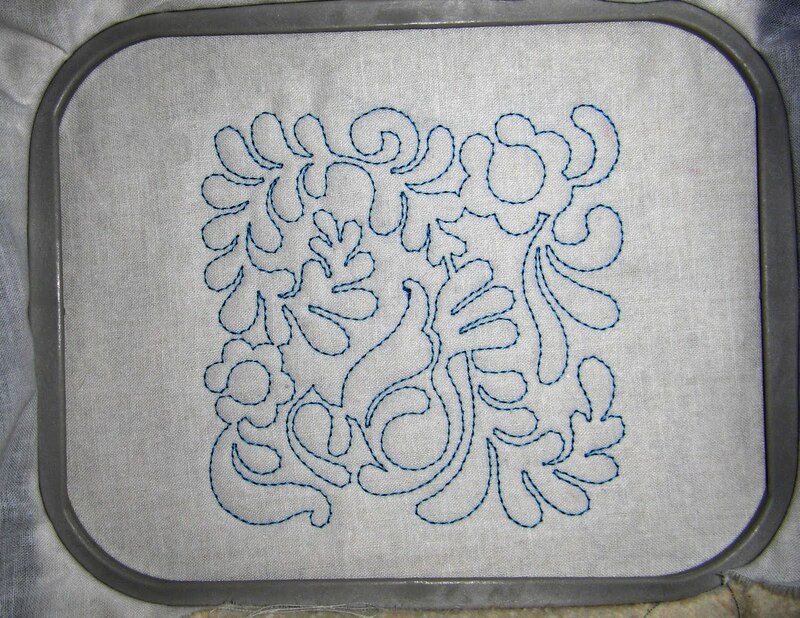 This will also help me work it out with my quilting method. I will quilt it in two parts then join the two pieces. So sashing was in order to "hide" my construction trick. The blocks will look something like these below. I haven't sewn any of the together. I have just made some of the parts. Sorry I didn't have them all really neatly laid out. Anywho, here they are. The one with the 4 patch middle is in yesterday's post. I cut lots of pieces for this. I think it will be a great quilt and I do believe the recipient will LOVE it.